SAN MARCOS — It was an unforgettable class, to say the least. Standing in the stark interior of a jailhouse, separated from the convicted felons by a red stripe on the concrete, Mary Ellen Brooks was ready to do the same thing she’d been doing for more than 40 years: teach a sociology class. Deliver the curriculum. Brooks’s class was the tip of the spear—a new partnership between Palomar College and the San Diego County Sheriff’s Department to provide classes to inmates while they are still behind bars. In the only partnership of its kind in North County, the Department pays for the textbooks and classroom materials, and Palomar provides instruction with support services. 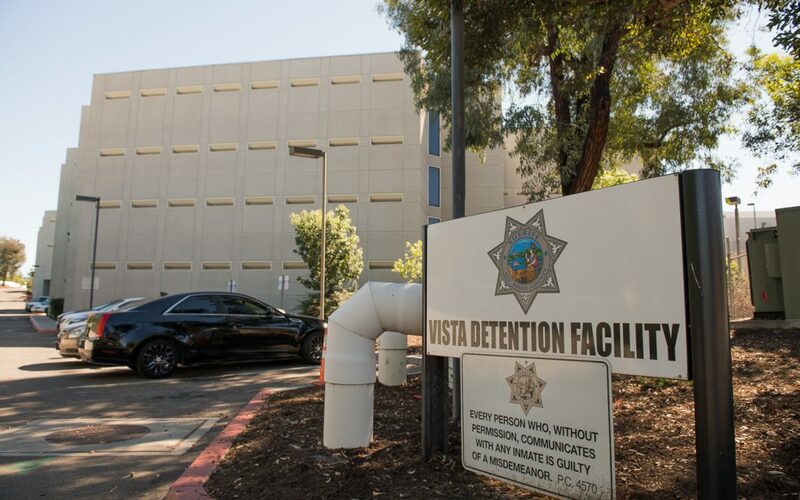 “It makes sense that you can combat recidivism by reaching students and giving them a leg up while they’re incarcerated, so when they leave they have something to start with,” said Suzanne Sebring, Director of Occupational and Noncredit Programs at Palomar. Previously, Sebring said, the Vista inmates didn’t have access to college courses for credit—there were only noncredit or “programming” activities like meditation or drug and alcohol counseling. But now, thanks to Palomar College, students behind bars can earn college credit while they serve their time—credit that counts toward degrees and, one day, jobs in the community. That day in the Vista jail, Brooks had a telephone on the desk in case anything went wrong. There were cameras everywhere. And in front of her, across the red line, 14 convicted criminals. She recalled nearly backing out in the weeks leading up to that first session inside the Vista Detention Facility. She was nervous and wasn’t sure it was a good idea. It helped that the inmates were part of the Veterans Module, where “you have to have been in the military, honorably discharged, and low-risk, which means you were incarcerated for a nonviolent offense,” Brooks explained. When Brooks wrapped up her final class of the semester, she headed for the door and the students all came across the red line. On Friday, Oct. 19, Brooks began her second class behind bars: Cultural Anthropology, a fast-track course that will wrap up before Christmas. Life is notoriously difficult for the formerly incarcerated, but a new program to support and integrate students who have served time is helping ease the transition at Palomar. Led by Martin Leyva, a formerly incarcerated Sociology professor from Santa Barbara, the campus effort includes a student club that meets once a week. Leyva has been instrumental in establishing a support network for formerly incarcerated students across North County, and he is now an adjunct faculty member at Palomar. 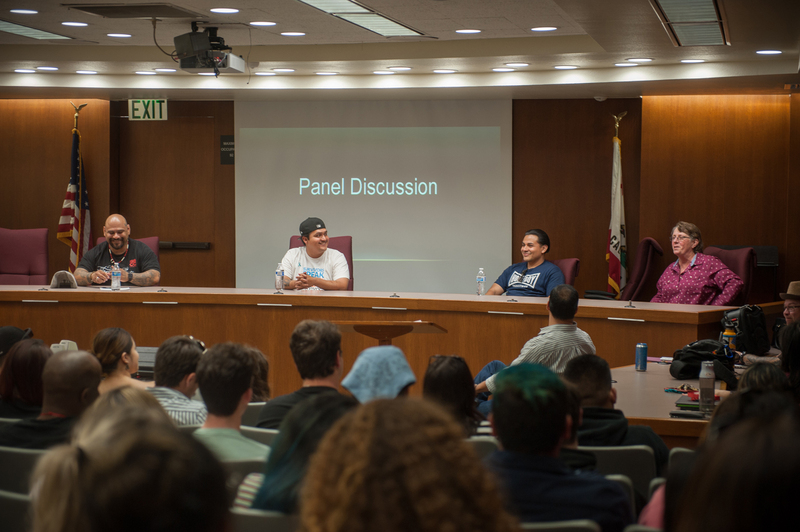 During Political Economy Days at Palomar College on April 11, 2018, Martin Leyva, Gregory Mendoza, Jose Juarez and Patty Petersen (left to right) participated in a panel discussion about life and education after incarceration. “I wish they had a Ph.D. for marginal education, because I learned on the margins, and I brought those margins into the classroom with me,” said Leyva, who now teaches Sociology at Palomar. This summer, 22 students entered the inaugural Transitions program, which Sebring described as a learning community specifically for the formerly incarcerated. They showed up Monday through Thursday for two courses and participated in peer counseling and team-building activities on Fridays. Of the 22 who entered the summer program, 19 finished and transitioned to enroll in their first fall semester, and 15 are enrolled full-time. Among them is Lawrence Morris, 60, a parolee who lives in Escondido and rides his bicycle 40 minutes each way to Palomar every day. Morris said that, as a younger man starting a life sentence, he quickly realized how important it would be to pursue his education while behind bars. He recalled a telling moment while he was serving as a GED tutor years ago: “At Soledad, I knew a grandfather, father and son from the same family who were all in prison at the same time—under circumstances that could have been broken by education. For her part, Sebring said she was “very excited” with the results of both the Vista jail classes and the Transitions efforts on campus. Many formerly incarcerated students set high goals for themselves. Morris, for example, has his sights set on a doctorate.